The Nintendo Switch is a console designed to live in two worlds. It is expected to hold its own as a home console while also serving as a handheld gaming device. The Switch does not excel in either way compared to its contemporaries, but I just don’t think that matters. The Switch is able to serve both purposes well enough to justify its purchase. In this case being a jack of all trades is NOT a liability. Without further fanfare: here is our Nintendo Switch review. The hardware specifications are the boring part. So let’s get them out of the way first, shall we? These numbers likely won’t mean much for the average consumer, but suffice it to say that in regards to home consoles smaller numbers are generally worse. The Nintendo Switch is underpowered compared to the other consoles on the market right now. This means that it won’t be able to output the graphics that most game developers would need to be able to put the same games on the Switch that they would on the PS4. As a result, it is possible that the Nintendo Switch may lose out on some of the higher end games that are released each year like Call of Duty, Battlefront, etc. Nintendo does have the strongest lineup of first party (internally developed) games of any of the console makers though. These companies are no stranger to making the best of underpowered hardware which they have been doing since Nintendo launched the Wii. We live in a world where almost everyone has a giant phone or a tablet. Mobile gaming is no longer the novelty that it used to be. As a result, the Nintendo Switch needs to do something different to stand out from the crowd. It needs to provide experiences that are unique to the console and superior to the other options on iPads and phones to be worth the increased cost. Fortunately, this is where the Nintendo Switch shines. All you have to do is pull the Switch out of its dock and you can take it anywhere to play the same games as you would at home. I know that I was concerned (before the console’s launch) that this would be a significant drop in the graphics. The drop is certainly there, but it isn’t nearly as severe as I was concerned about. Instead I am left with a console where I can truly play console quality games wherever I go. That is an amazing feeling and one that cannot be reproduced on any other piece of hardware on the market today aside from the Nintendo Switch. The Nintendo Switch is limited by the size and power of its battery. 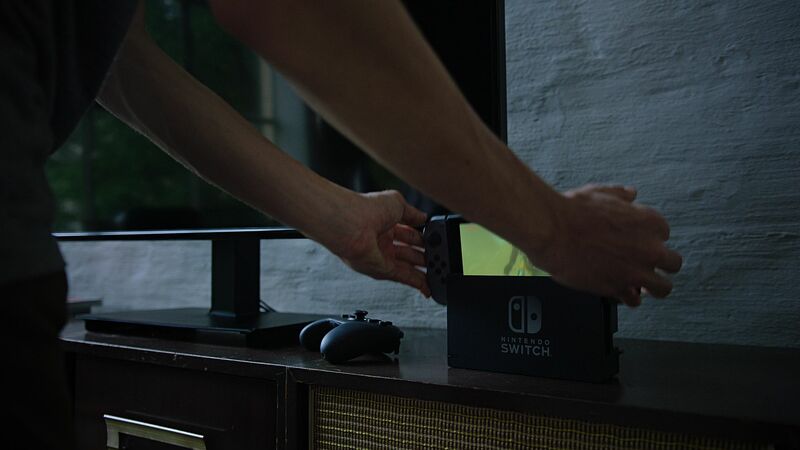 Our experiences and testing has shown that a fully charged Switch will last for between 2-3 hours undocked while playing graphics intensive games like The Legend of Zelda: Breath of the Wild. It is worth noting, however, that the Switch is compatible with USB C cables and will work with many of the popular portable chargers on the market. Using one of those will definitely extend the battery life of your device. The Nintendo 3DS, the PSP, the PSVita, and many others have given us portable gaming before. That really isn’t anything new. The Switch, however, offers options for gaming experiences on the move that were never possible before. The biggest new feature is the ability to play local multiplayer games like Super Mario Kart 8 Deluxe anywhere we want. This is going to be one of the biggest features for our family and for many others, I’m sure. Our kids have had 3DS systems for years, but they have never been able to play their home console games anywhere else without moving the whole system. The fact that they can easily play multiplayer games on the thanks to the multiple Joy-Cons included with the console is just an added bonus. Each Nintendo Switch includes a pair of Nintendo Joy-Con controllers. They will attach to either side of the Switch tablet or to either side of a special controller called the Joy-Con grip. The Joy-Cons are definitely small so you will need to be careful not to lose them. The Joy-Con Grip is a reasonable facsimile of a controller and will work for a while. But, if you or your family intends to play games for any length of time then I recommend the separate purchase of the Switch Pro controller. This is a controller that is built to be similar to the controllers for the other home consoles. It also happens to be a very good controller. As of today’s writing, Nintendo is offering a minimalist online experience for its online focused games at no charge. That will change later on in 2017 when they add in a paid online service that will include a multiplayer app along with other functions at a premium charge (estimated to be around $30 annually). We will have to see how that shakes out as they explain the service to us over the summer. Consoles live and die by the power of their games library. As of right now I feel very strongly that the library for the Switch is large enough to justify a purchase. The fact that the system launched with the Legend of Zelda: Breath of the Wild was likely enough, but in the months that have passed the library has only grown with such titles as Graceful Explosion Machine, Super Mario Kart 8 Deluxe, and Puyo Puyo Tetris. The Nintendo Switch is an amazing device. It is not going to replace any dedicated home consoles like the PS4 or Xbox One in terms of sheer power, but I don’t think that matters. This is a tremendous system that will be a worthy purchase for any family. 2017 Spiel des Jahres Nominees Announced!